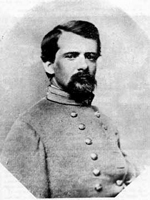 Confederate General John Pegram was killed at the Battle of Dabney’s Mill, Virginia. Throughout his life James continued his familyÃ¢â‚¬â„¢s longstanding tradition of public service, becoming an active Whig orator; and, sometime between 1830 and 1841, he was appointed a colonel and then brigadier general in the Virginia militia. By 1844, Virginia Pegram had given birth to five children, and James had accumulated sufficient capital to invest in plantations. In October, John Pegram remained in Richmond with his mother and siblings while James made a fateful trip to Mississippi. An accident aboard a steamboat on the Ohio River made Virginia Pegram a widow and left her children fatherless. The shock of JamesÃ¢â‚¬â„¢ death left the family emotionally traumatized and financially reduced, though certainly not ruined. Virginia moved her family back to her fatherÃ¢â‚¬â„¢s plantation, but her fatherÃ¢â‚¬â„¢s fortunes were on the wane and the family, while remaining high on the social list, was not quite so secure financially. In the mid-1850Ã¢â‚¬â„¢s, Virginia started a school for girls in Richmond. The school remained open during the war years and the income, including income from boarders, augmented VirginiaÃ¢â‚¬â„¢s inheritance nicely. 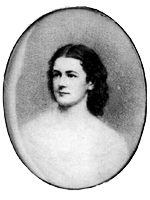 The engagement of my cousin Hetty Cary to Brigadier- General John Pegram having been announced, their decision to be married on January 19 was a subject of active interest. My aunt, Mrs. Wilson Miles Cary, of Baltimore, had before Christmas obtained from Mr. Lincoln, through General Barnard (chief of the United States Engineer Corps, married to her adopted daughter), a pass to go to Richmond to visit her children. The presence of Mrs. Cary gave General Pegram opportunity to urge that his marriage should not be longer delayed, and such preparations as were possible were hurried on. Then, on 6 February 1865 – less than three weeks after the wedding – Pegram was killed at the battle of HatcherÃ¢â‚¬â„¢s Run when his division and “Little Billy” MahoneÃ¢â‚¬â„¢s fought off a Union raid on LeeÃ¢â‚¬â„¢s flank. Pegram’s body was returned to the same church, St. Paul’s Episcopal, and his young widow knelt beside his coffin as the minister who married them presided over the dashing general’s funeral ((Dr. Minnegerode). Pegram is buried at Hollywood Cemetery in Richmond. Despite the fact that Pegram’s peers often challenged his tactical military skills, Pegram was held in high esteem by those who valued the fact that the Confederacy had lost far too many generals at a time when the south needed them most. 1 A recent biography of John PegramÃ¢â‚¬â„¢s youngest brother, Willy, provides valuable insights into the Pegram family. See Peter S. Carmichael, LeeÃ¢â‚¬â„¢s Young Artillerist: William R. J. Pegram (Charlottesville: University Press of Virginia, 1995), p. 7-13.